[Battlemoor IV in Colorado. 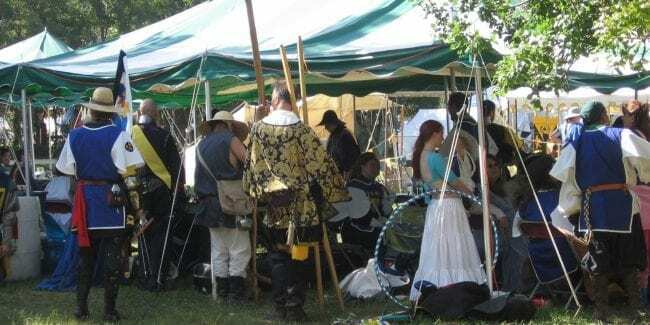 Photo: rozewolf.wordpress.com] This is a unique outdoor event organized by the Kingdom of the Outlands, which is part of the 20 Kingdoms of the Society for Creative Anachronism. The event started in 2009 and recreates and celebrates battles and celebrations back in the old age. People pitch their tents, dress up as knights, and recreate the glorious battles that were won and lost many years ago. This year’s Battlemoor X will be held from Tuesday to Sunday, July 9th to 14th, 2019. Battlemoor used to hold their yearly activities at the Stroh Ranch in the north of Walsenberg. They eventually moved their location to Cottonwood Meadows Farm in Buena Vista. There will be armored combat tournaments, archery, equestrian activities, an artisan lane, and revelry where you are welcome to join in the festivities and grab some drinks.